Solo artist Victoria Hammill with her electric Zeta Five string violin powered by Mesa Boogie and Real McCoy - is a true blues/rock/rhythm 'n blues/jazz fusion violinist and vocalist, with passion, energy, tone, and stellar delivery and presence. 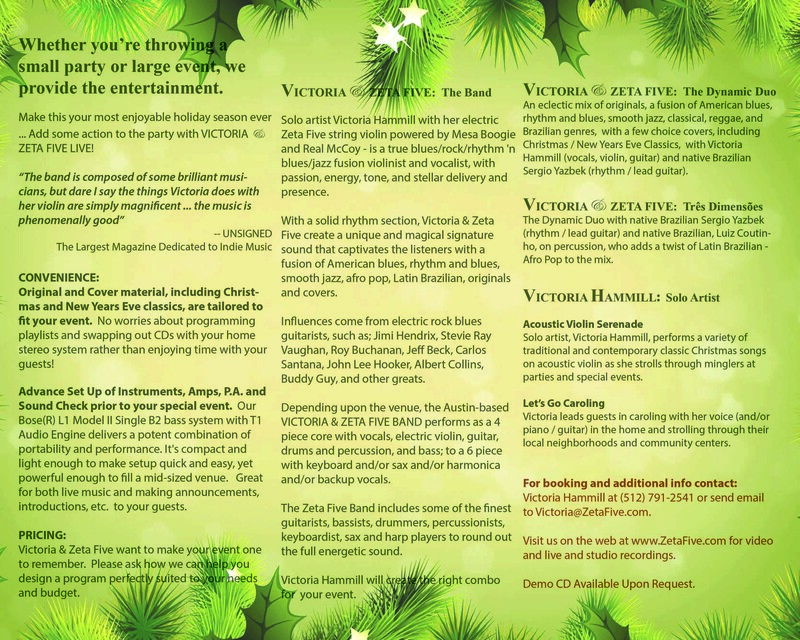 With a solid rhythm section, Victoria & Zeta Five create a unique and magical signature sound that captivates the listeners with a fusion of American blues, rhythm and blues, smooth jazz, Afro Pop, and Latin Brazilian originals. Depending upon the venue, the Austin-based VICTORIA & ZETA FIVE BAND performs as a 4 piece core with vocals, electric violin, guitar, drums and percussion, and bass; to a 6 piece with keyboard and/or sax and/or harmonica and/or backup vocals. The Zeta Five Band includes some of the finest guitarists, bassists, drummers, percussionists, keyboardist, sax and harp players to round out the full energetic sound. Victoria Hammill will create the right combo for your event. House Concerts, Restaurants, Libraries, Museums, Community Centers, Private Parties - Christmas, New Years Eve, and other holidays and special events. In 1993, Victoria began writing songs with guitarist, songwriter, and producer, Edward T Hammill. As a co-writing team, they have written numerous songs. Most recently, they cut the Quiet Storm / New Americas, Janaina, and Fast Track, all pieces of which fuse American blues, rhythm and blues, smooth jazz, classical, and Brazillian genres, at Eclectica Studios in Austin, Texas. An eclectic mix of these originals with a few choice covers can now be heard LIVE with Victoria & Zeta Five: The Dynamic Duo. The Dynamic Duo featuring native Brazilian, Luiz Coutinho, on percussion, adds a twist of Latin Brazilian - Afro Pop. Victoria sings and plays violin, guitar, and keyboard, and writes music and lyric. She is available for hire to perform solo at live music venues and intimate parties, with other bands and small ensembles, studio / session work, collaborations with other artists, and at wedding ceremonies, baptisms, memorial services, meditations, and for private and group instruction. Solo artist, Victoria Hammill, performs a variety of traditional and contemporary classic Christmas songs on acoustic violin as she strolls through minglers at parties and special events. Victoria leads dinner party guests in caroling with her voice in the home and strolling through their local neighborhoods and community centers.